The EM500 has eight general-purpose I/O lines GPIO0-7 grouped into a single 8-bit GPIO port P0, plus one serial port. GPIO0 and GPIO1 lines double as interrupt inputs INT0 and INT1. The serial port has four I/O lines: RX, TX, CTS, and RTS. TX and RX lines belong exclusively to the serial port and are separate from the GPIO lines. CTS and RTS lines do not exist independently. Rather, either GPIO0/INT0 or GPIO1/INT1 can be selected to serve as the CTS line, while any of the GPIO0-7 lines can be selected to serve as the RTS line. The serial port of the EM500 can work in one of the three modes: UART, Wiegand, or clock/data. TX, RX, CTS, and CTS lines have different names and functions in the Wiegand and clock/data modes. Serial port operation is described in detail in the documentation for the serial (ser.) object found inside the "TIDE and Tibbo BASIC Manual". Additionally, see the Platform-dependent Programming Information section inside the EM500 platform documentation (same manual). In total, the EM500 has ten I/O lines (GPIO0-7, TX, RX). The simplified structure of one such I/O line is shown on the circuit diagram below. All lines are "quasi-bidirectional" and can be viewed as open collector outputs with weak pull-up resistors. There is no explicit direction control. 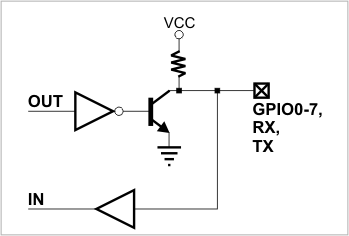 To "measure" an external signal applied to a GPIO line, set this line to HIGH first, then read the state of the pin. It is OK to drive the pin LOW externally when the pin outputs HIGH internally. Each I/O line has a weak pull-up resistor that prevents the line from floating when the output transistor is closed. All I/O lines are 3.3V, CMOS, 5V-tolerant. The maximum load current for each line is 10mA.